Budapest, the central railway station, track 1. Time for departure to Trencin! Pavel Matocha, an excellent organizer and the inspirer of the Chess Train project, with the author of this report. I've just got an email from Eugeny Surov and conveyed his greetings to Pavel. That day saw only one round, so I had enough time to take pictures. Besides, the outside views were really picturesque. Meanwhile, the chess battle was going on. 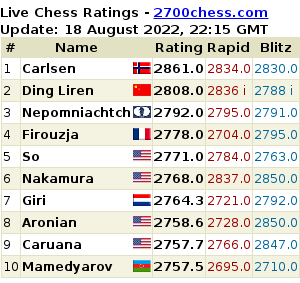 Vlastimil Hort won all his games prior to his loss to the Australian guest, GM Ian Rogers (who is known not only as a chess player, but also as an excellent commentator and journalist - CN). ...while the rest were playing in separate compartments. When a compartment is closed a game can still be observed through the door glass. In fact, playing in compartments is much more comfortable. At least, so it seems to me - you are not disturbed, you can get more fresh air, etc. Wouldn't it be more logical if the leaders sat here instead of outsiders? The cars of the train were named after the world champions, as usual. For example, now I'm exiting the Botvinnik car (where the outsiders were playing) and entering the Smyslov car (for the spectators and accompanying persons). The Spassky car was the luggage one. We are approaching Trencin. This is Dr. Guenter from Germany who told me that he had participated in all previous Chess Train editions and had always scored 50%! Can you guess how many points he had after round 6? However, this time he would eventually collect fewer points than usual. For the Chess Train passengers, a special tour to the castle was organized. Pavel Matocha, Ian Rogers, Martin Petr (you can hardly find him on the picture) among the visitors. And this is exactly our train! The tournament chief arbiter Petr Herejk with the author. The walls of the castle attract goats as well. 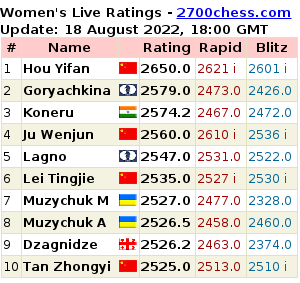 None of the leaders managed to win in the final round - two top games were drawn, while IM David Kanovsky suddenly lost to an Egyptian amateur. Kanovsky had been staying in the lead for almost the whole tournament, but... Sports is sports! As a result, Ian Rogers and Martin Petr got 9 points each, while a large group was tied for the 3rd place, including two Russian players! Of course, we went to the restaurant car to celebrate our success. This is me with our wonderful waitress. The prize-giving ceremony started immediately upon arrival back at Prague. Martin Petr being awarded for the 2nd place. Vlastimil Hort got the 3rd place. Ian Rogers of Australia became the winner due to his better tiebreak. From left to right: Hort, Matocha, Rogers, Petr and the representative of Czech Railways Pavel Krtek. After a non-chess Vienna - Prague - Salzburg - Vienna journey in 2013, I have fallen in love with the Czech capital. Just a couple of days spent in Prague have been enough for that.